Darren’s concerts are always fun, sophisticated, innovative and highly entertaining. He has a variety of show options to choose from for your next event! 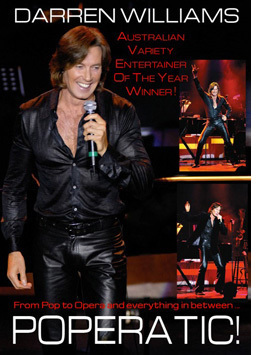 From Pop to Opera, Broadway to Vegas, Disco to Divas, POPERATIC is Darren Williams’ Multi MO and ACE Award winning show. Highlighting Darren’s amazing 5 OCTAVE VOCAL RANGE, this show features his most requested songs and inspires any audience to a standing ovation. According to budget and venue, Darren can customize his award winning POPERATIC show to suit just about any occasion and demographic. *Best performed with a band consisting of at least trio, or up to a 14 pieces, or with Darren’s state-of-the-art backing tracks. This show can run between 30 – 90 minutes. Receiving rave reviews in New York, NOT THE BOY NEXT DOOR pays homage to the life, loves, and music of treasured Aussie icon, PETER ALLEN. 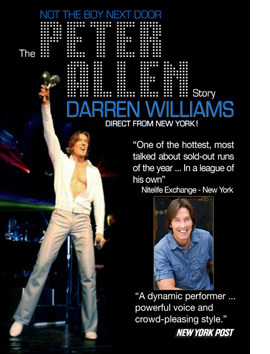 From I HONESTLY LOVE YOU to ARTHUR’S THEME – DON’T CRY OUT LOUD to I GO TO RIO, Darren also performs Allen’s hidden gems and shares little known anecdotes from his humble beginnings in small town Tenterfield, to marrying into showbiz royalty, to conquering stages and record charts worldwide. *Best performed with Darren’s Musical Director and a band consisting of a least trio, up to 9 pieces. This show can run between 40 – 90 minutes. 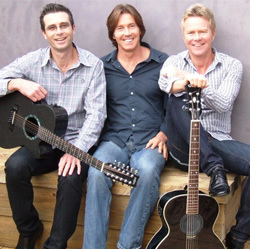 Bringing together the wonderful vocal harmonies of Warren Jnr, Andrew & Darren Williams, BROTHERS IN HARMONY is a celebration of the wonderful songs and artists who greatly influenced the musical careers of these Multi Award winning siblings. * Best performed with a band of up to 5 pieces. This show can run between 40 – 120 minutes. DARREN WILLIAMS teams up with European Award Winning Entertainer, ADRIENNE HAAN in TRANSATLANTICA, a multi-lingual feast of popular tunes from around the world. Including hits from The Great American Songbook, plus classics in French, Italian, Spanish, German, Yiddish and more, this show has true international appeal. * Best performed with up to a 4 piece band, or their state-of-the-art backing tracks. This show can run between 40 – 90 minutes.